I want to be able to make simple posters/flyers by combining multiple images and text. GIMP is widely recognised as a quality free alternative to Photoshop in many regards. If you want something that isn't necessarily free but is at least inexpensive, then there are a number of other programs including Acorn and Pixelmator available in the Mac App Store. You could always try the cut down Photoshop Elements. The only free alternatives I know of is GIMP. I don't like it. I don't use it, and I can't tell you anything about it. 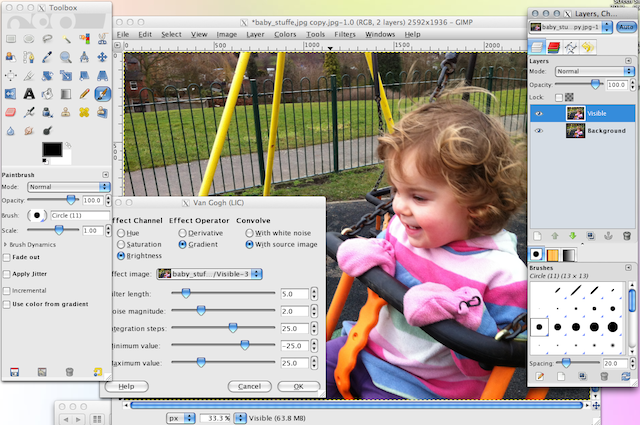 Ugly is as ugly does—and I don't find GIMP's interface conducive to creative work. If we change free to low-cost my first choice is Pixelmator. It has a clean and (relatively) intuitive interface, supports layers and, most important to me, has a content aware fill feature. Lots more info and some great tutorials on the website. You can also try Seashore which is a scaled down version of gimp. You can have a look at this chart they have created which compares the features of GIMP, Acorn, Photoshop Elements, Pixelmator and Seashore. Using this you will be able to find what features you need from the editor and make an informed decision whether to stick with a free solution or buy a low cost solution. My favourite photo editor is online Pixlr. I think you'll find Pixelmator a good alternative to Photoshop. You can get it on the Mac App Store for $14.99. Okay, mark me down for ignoring the "free" part of the question, but I'm really quite fond of Aperture for the combination of editing and organizing that it does. It fills about 95% of what I used to use Photoshop for, plus I can keyword photos, maintain versions of edits, label faces and search for similar ones, and much more. It's become the centre of my photo organizing and editing activities. Together with Apple Pages, I can do just about anything I want to do regarding photo editing, organization, and end use. It won't do "flaming text" or other "graphic arts" sorts of things that Photoshop does, though. I don't miss that. 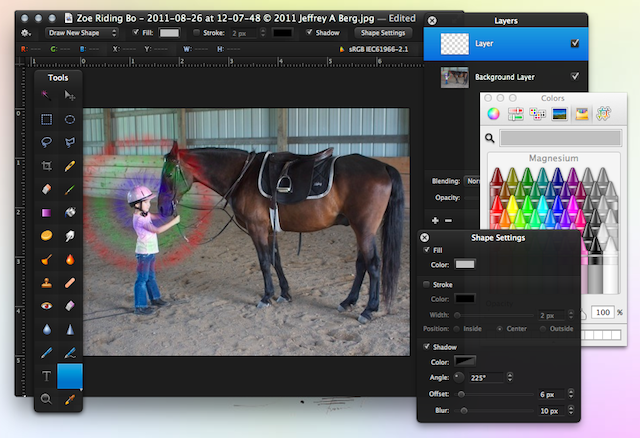 There's another free, browser based, alternative: Photoshop Online. Not the answer you're looking for? Browse other questions tagged lion software-recommendation adobe-photoshop . Is there an image editor like Windows' Paint for OS X? Are there viable and cheaper alternatives to Photoshop? One Note alternative for Mac? How to change photoshop JPEG output header format? How to make Photoshop use multiple windows?